Cindy Mizuhara, CVT, VTS(ECC), describes hyperthermia, covers the causes and treatment for dangerous hyperthermia, and when to let the body’s own defense against infection do its job. The term hyperthermia is defined as an elevation of normal core body temperature. This is due to an imbalance between heat production and heat loss. The central nervous system, specifically the hypothalamus, is responsible for regulating temperature control. Hyperthermia is divided into two categories: pyrogenic (fever) and nonpyrogenic (heatstroke). Pyrogenic hyperthermia is a result of the hypothalamus being reset to a higher point than normal. Nonpyrogenic hyperthermia is caused by external or environmental factors, and the hypothalamus “set point” remains normal but the ability to regulate body temperature is lost. A true fever is the body’s response when exposed to any endogenous pyrogens (cytokines released from cells of the immune system) or exogenous pyrogens (antigens associated with bacterial, viral or parasitic infections, inflammation, neoplasia and some medications). The hypothalamus’ “set point” is abnormally elevated. The result is an increase in the tissue oxygen requirements and an increased metabolic state. 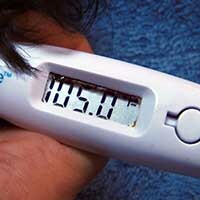 Although still controversial, a low grade fever below 106F may actually be beneficial as the fever decreases the growth and replication of many bacteria and viruses and can increase white blood cell activity. Whole body cooling such as cool water baths, alcohol soaks and fans can be detrimental as the hypothalamus will still be setting its thermostat to a higher “set point.” Temperatures less than 106F, unless prolonged, are usually not life threatening. Heatstroke is an inability to adequately dissipate heat. Unlike a fever, the “set point” remains normal. The causes are numerous: being stuck in a hot car or dryer, exercise intolerance with high humidity, thick hair coat, brachycephalic airway syndrome, laryngeal paralysis, hyperthyroidism, seizures, tremors, cardiovascular disease, overzealous reheating and hot oxygen cages. Patients can present with weak pulses, panting, listless, vomiting, diarrhea, ataxic, hyperemic mucous membranes, and collapsed. Panting is an evaporative cooling mechanism to dissipate heat. It is not as effective in high humidity environments or if the temperature rises too quickly. Vasodilation will help eliminate heat by convective mechanisms. 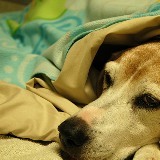 Pets will want to rest on a cool surface to maximize body surface contact. 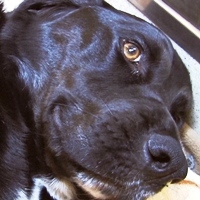 Initial care of a heatstroke patient is different than that for a pet with a fever. The most important goal is to cool the core body temperature, preferable over 30-60 minutes, to 103F. Cool, not cold, water soaking usually is the first step. Using cold water will cause vasoconstriction and thus reduce the ability to dissipate heat. The target rectal temperature is 103F as the thermoregulatory center in the brain is not acting normally and overcooling can occur. Room temperature IV fluids will restore blood volume, improve renal blood flow and help normalize electrolyte imbalances. Antibiotics will minimize complications of bacterial translocation of the gastrointestinal tract. Hyperthermia of any kind that results in a temperature greater than 106F can result in cell damage and death. Adaptive measures will begin to fail resulting in splanchnic vessels contracting in an attempt to maintain adequate circulating volume. Heart rate and cardiac output will initially increase to increase peripheral circulation. Soon blood pressure and cardiac output will begin to decrease as will circulating plasma volume and hypovolemia ensues. Organ perfusion diminishes causing organ damage. Sluggish blood flow with hypotension and a decrease in clotting factors due to hepatic injury can lead to DIC (disseminated intravascular coagulopathy). Neuronal damage will lead to cerebral edema. CNS damage will lead to seizures, coma and death. Diminishing organ perfusion will cause organ damage leading to sepsis, SIRS (systemic inflammatory response syndrome), which in turn, can lead to multiorgan failure and death. Temperatures greater than 109F will result in thermal injury to tissues, irreparable organ damage, and even death. Mortality rates are directly related to the duration and intensity of hyperthermia. Care of the recovering patient can be intensive. Frequent rechecks of temperature and blood pressures until normalization is a must. Monitoring of mucous membrane color and refill time, checking for petechiation, any catheter sites or surgical sites for infection or inflammation should also be part of routine patient care. 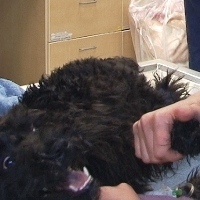 Monitoring of wounds for signs of necrosis or infection, pain management from gut sloughing and monitoring urine output, preferable with a closed urine collection system, to assess the health of the kidneys is also recommended. Recumbency changes for obtunded patients will decrease the chances for bed sores as will removal of any soiled bedding. Could you explain the "ice packs" vs "no ice packs" treatment during the triage/stabilization phase of nursing? Thanks for the question Lesley! We rarely use ice packs for active cooling. A couple reasons are 1) it's best to try to cool at a controlled pace, with a goal of cooling over about an hour and stopping active cooling at 103 degrees. 2) We chose other methods of active cooling because ice packs will cause vasoconstriction and essentially trap hot blood in the patient's core. Some of our most basic treatment options prove to be more successful. 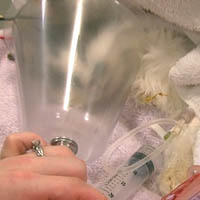 IV fluids, a damp towel and a fan combined with addressing the cause of the patient's hyperthermia will work wonders!